Carlsbad is located approximately 35 miles from downtown San Diego and has a current population of 104,000. It is bordered on the South by Encinitas and to the North by Oceanside. Carlsbad has many attractions and there is surely something for everyone. For the youngsters there is Legoland amusement park. There is also parasailing, jet sking, and the flower fields. March through May is the best time to visit the flower fields. 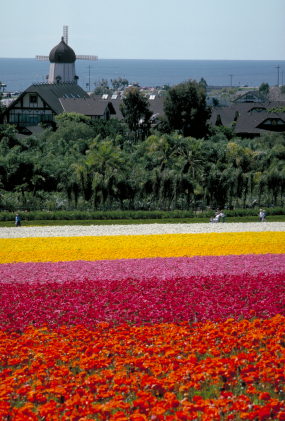 A whole hillside turns every imaginable color and visitors can stroll through this wonderland for flower-lovers. Carlsbad State Beach is easily accessible and offers surfing and camping. The two world class attractions in located here are The La Costa Resort & Spa and The Four Seasons Resort, Aviara. La Costa Resort & Spa offers two 18 hole golf courses as well as tennis and fine dining. Major events in Carlsbad throughout the year include triathlons and the Toshiba Tennis Classic at La Costa Resort & Spa as well as the Acura Classic. Many people come to our city to simply shop. Carlsbad Premium Outlets are centrally located in Carlsbad, next to the flower fields and offer some of the best shopping in San Diego. Average home prices in Carlsbad are in the $650,000 range, but differ substantially depending on proximity to the ocean, lot size, and specific community.